Welcome to Morgan Properties online coverage, which features press releases, corporate communications, social media, thought leader commentary, transactions and articles generated across various media outlets. If you are a reporter writing a story or on deadline and you require information, please contact our PR Agency (listed below). Nearly 2,700 low-cost apartments in Alexandria were just sold to a new owner. What does it mean for the tenants? We are very excited to be on this list for Top Owners and even more excited to have moved up 10 spots from number 35 to 25. The three factors that concern rental-seeking families the most are location, value, and convenience, according to Carol Jackson, an area vice president at Morgan Properties. 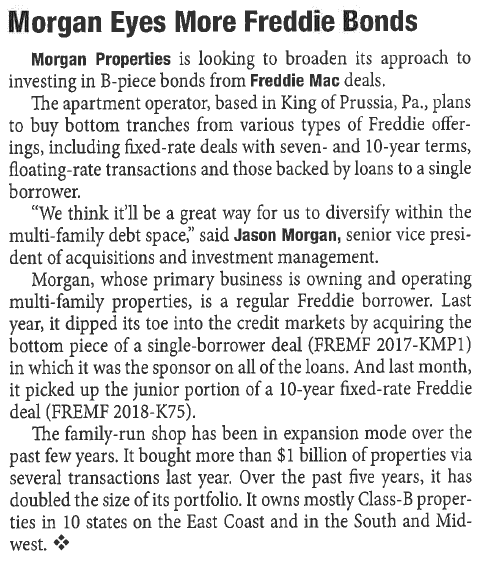 The Baltimore Business Journal listed the largest residential property managers in Greater Baltimore and we are proud to announce that Morgan Properties was listed as the second largest residential property manager in the city. Morgan Properties named Management Company of the Year at the New Jersey Apartment Association Garden State Awards Gala! Morgan Properties Shines at the Maryland Multi-Housing Association "Star Awards"
National Denim Day - Call it "casual Friday for a cause and cure. The 2016 Apartment Association Award season kicked off last week with the PAA East Awards Gala. It was again an evening of strong results for our Morgan Properties TEAMS!